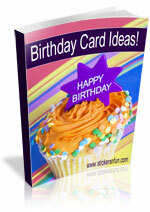 With Easter only a couple of weeks away, it’s time to start thinking about those last minute Easter card ideas. Unfortunately, I am always leaving things until the last minute so never have much time for my creations. To help me with my time management skills (or rather, my lack of time management skills), I always turn to sketches, and this time is no exception. This cute Easter card idea is based entirely on one of my sketches and is featured along the sketch and complete easy-to-follow instructions in my 50 Card Making Sketches collection. 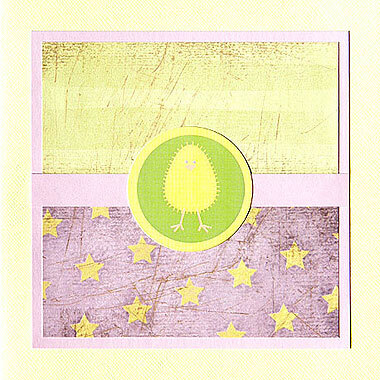 This card follows sketch #9 from the collection and features an adorable Easter chicken motif. Materials Used: Yellow Bazzill cardstock, Karen Foster Circus Stripes paper, purple cardstock and Pebbles Inc Easter stickers. One of the advantages of using a sketch as the basis of your card is that you don’t have to worry about how to arrange the different elements on your card. I can spend ages procrastinating about what works if I don’t start with a sketch. The sketch shows me what works right from the beginning so I can focus on the fun part of choosing papers, colours and embellishments. Soft pastel colours lend themselves particularly well to Easter creations. As you can see, I have chosen soft greens, yellows and purples for my colour scheme. Pinks and light blues also work well. But of course, any colours can be adapted to suit your theme. Play around with different combinations and see what you like best. A sketch will also show you where the focal point of you card will be, giving you a chance to select the most suitable embellishment in advance. For example, the sketch I used to create this card has a circle in the centre of the card as its main focal point. So, I choose a cute Easter chicken looking forward as my embellishment. If the focal point had been somewhere else, like in the bottom right corner, I may have preferred a chicken looking to the left and upwards as it may draw the card together better. The focal point of your Easter card idea can be either playful and fun or more reserved and religious. Playful cards might feature cute motifs like my Easter chicken, Easter bunnies, Easter eggs or even the famous Australian Easter bilby. Or, if you wish to create a more religious card, you may consider using images of the Cross or Christian Easter quotes as the perfect focal point of your card design. Whatever your colours and whatever your motif, starting with a sketch gives you direction and focus. You don’t have to worry about trying to fit everything together so it looks right. You get to just pull out your supplies and have some fun. At the end you’ll feel refreshed, relaxed and proud of what you’ve made…and you won’t be able to wait to show them off! This entry was posted on Saturday, March 20th, 2010 at 8:36 pm	and is filed under Card Making, Easter. You can follow any responses to this entry through the RSS 2.0 feed. You can leave a response, or trackback from your own site. Jen, it is adorable as you say. Terrific. do u have idea about bunny eggs or something with money pocket cards? which has been written about for ages. Wonderful stuff, just great! and go well with everything. We simply love HardX. You can get your day started or end your evening with a beneficial treadmill workout. possible to do all of this while watching television so that exercise can be performed without having any interference in your normal daily process.